The best wireless backup camera system for Aerial Lift truck includes a cherry picker Box camera that features a 120° Degree viewable angle, its waterproof and has auto night vision. The camera is one of the most durable we have, with incredible adjustability and night vision clarity. The rear view camera has a metal sun shield visor to protect you from glare and pebbles. The wireless back up camera is very customizable because all it needs is a 12-36 volt power source. Some of our customers have added a 2nd wireless backup camera and mounted it on the top of the cherry picker by using the local power if accessible or by getting another one of our heavy duty rechargeable battery packs (SKU88729) which last up to 18 hours. This is by far our toughest built camera. It has been regularly used in many industrial and commercial applications from vans, buses to even industrial sized caterpillar trucks, operated in the harsh oil sand of Canada. This Rearview camera for Fork Lifts can take a direct hit from a rock and it will still work like new, you can mount this anywhere on your aerial lift, some have also used this specifically on a cherry picker. This backup camera is high range wireless (up to 120ft) as well so there will be no need to run a cable. It is also battery operated so there are no cables at all. Finally, you can make it a two camera system if you need even more coverage. If you don't need these options or want others call us and we can make this system custom for you 866-966-5550. This backup camera system, like most of our vehicular products that have an LCD screen, can be used for video gaming, Considering that a perk or bonus for purchasing our back up system (others block that feature). 30 Days 100% money back guarantee. We know our products are world class and we stand by them 100%. We even have a 24/7 tech team ready for any questions youhave. Buy with confidence the TadiBrothers team won’t let you down. 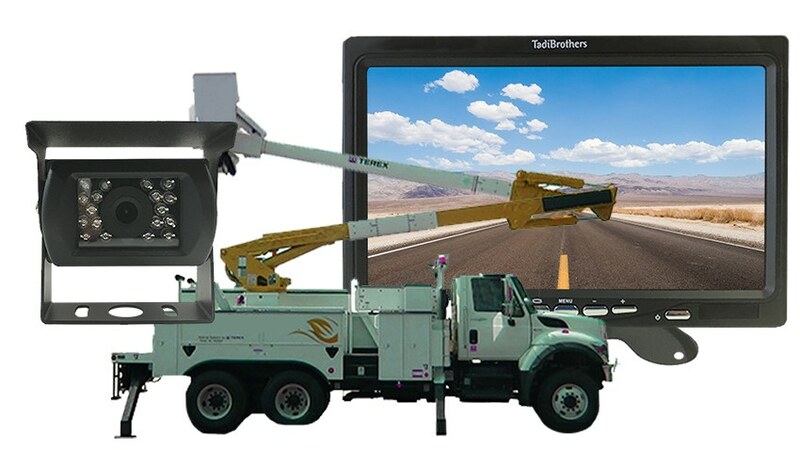 "I bought a Tadibrother Aerial Truck Back up Camera The Monitor was a 7 inch The color is great and Picture I would recommend this to any one with a Truck or RV."